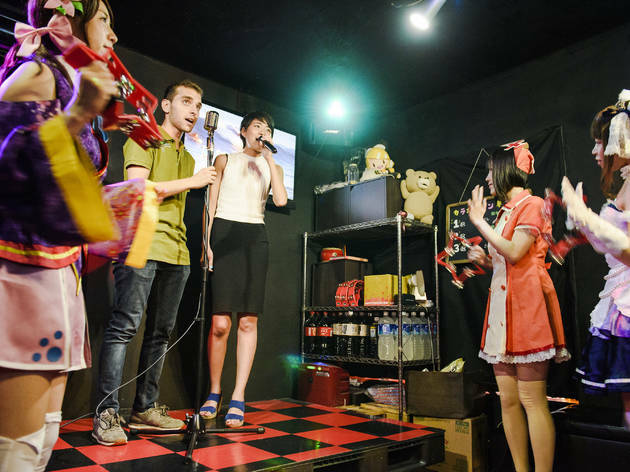 Occupying the fifth floor of an inconspicuous building on an Akihabara backstreet, the Anikara Hero bar offers you a karaoke experience that will blast your singing skills from zero to hero. Admittedly, the small bar is a rather modest affair, but what it lacks in frills it more than makes up for in thrills. 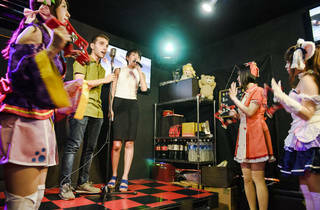 After you find your go-to tune in their extensive library and take your place on the stage under the spotlight, the in-house cheerleaders (in full cosplay) will get in formation and begin to thump out a rhythm with their tambourines. Don’t worry about those high notes in the chorus – their hearty cheering is guaranteed to add an extra octave to your vocal range.